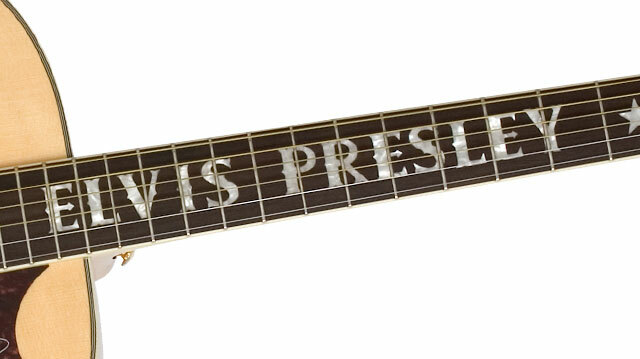 Epiphone, in cooperation with Elvis Presley Enterprises (EPE) offers the Elvis Presley Signature acoustic/electric, an exact replica of Elvis’ favorite J-200 style acoustic that was his go-to rhythm guitar, most famously seen during Elvis' spectacular return to live performances in 1969 in Las Vegas. Check out the live concert film That’s The Way It Is to see the vintage version of this guitar in action! Elvis is seldom noted for his musicianship. Yet it’s Presley’s steady hand playing rhythm guitar on all the legendary Sun Records sides recorded in Memphis with Sam Phillips and his early days at RCA. Bandmates like Scotty Moore and James Burton have frequently noted that Elvis’ groove on rhythm was always right-on. Now, EP’s groove can be yours with the Elvis Presley EJ-200E. When the J-200 was first introduced in the late ‘30s, it immediately filled a need for a deeper, more balanced and powerful acoustic instrument that could project over stage and radio. The J-200 was a radical new guitar, bigger and bolder than any previous design, capable of projecting well beyond any other acoustic on the market—a fact that still holds true today. Like all Epiphone’s the Elvis Presley EJ-200E comes with our Limited Lifetime Warranty and Gibson 24/7/365 Customer Service. Visit your Authorized Epiphone Dealer today and check out the fit-for-a-king EJ-200E while they last. 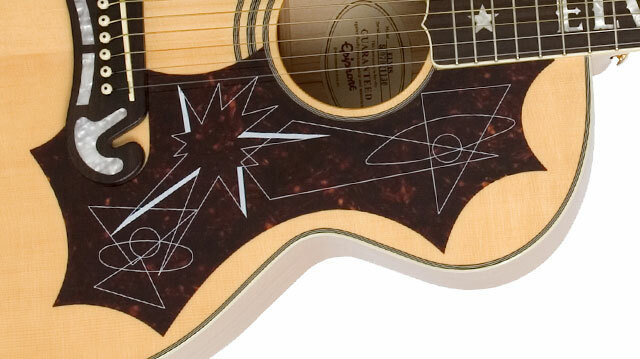 The EJ-200E features a maple body with a handlebar-style rosewood bridge with pearloid inlay and a reproduction of Elvis’ one-of-a-kind pickguard with period perfect geometric “Sputnik” graphics and a re-creation of the original “Elvis Presley” and “star” designs that Elvis ordered for his original. The King’s EJ-200E has a maple SlimTaper™ neck with a 25.5” scale, a rosewood fingerboard, a 1.68” nut and “Elvis Presley” and “star” pearloid inlays along with a classic Epiphone Sloped Dovewing headstock. The EJ-200E also features the NanoFlex™ eSonic ™ Preamp system. Epiphone's eSonic preamp system and the revolutionary NanoFlex under-saddle pickup gives you the control and sound quality you need when performing live. 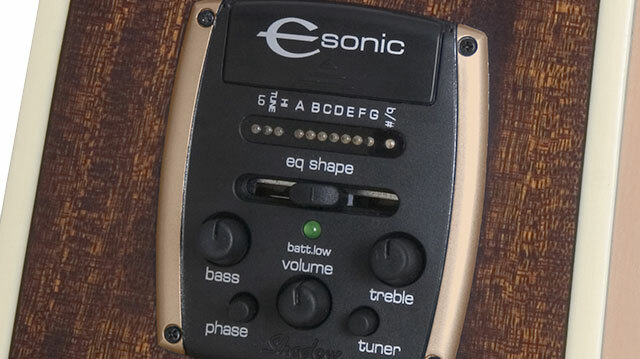 Designed in cooperation with and made by Shadow of Germany, the eSonic is a small, lightweight preamp powered by two long-lasting lithium batteries. It features a fast and extremely accurate built-in chromatic tuner that allows you to "mute" the output of the guitar while tuning or while "unplugging" to avoid any loud "pop." Other controls include Master Volume, Treble and Bass EQ, a Dynamics slider that acts as an EQ frequency shifter, and a "phase" switch to help eliminate feedback. Under the saddle is Shadow's Nanoflex pickup. Unlike a piezo, the NanoFlex design utilizes 7 highly-sensitive and ultra-responsive layers of sensor material to not only sense the vibrations of the strings but the vibrations of the guitar body as well. This produces results equivalent to a condenser-microphone mixed with an under-saddle pickup. The Nanoflex is the first pickup to incorporate active amplification directly at the pickup. As a result, the signal does not pass through even a single millimeter of the wire and therefore, the signal quality is never compromised. Combined with its 100% shielding, the Nanoflex is absolutely and completely noise free. 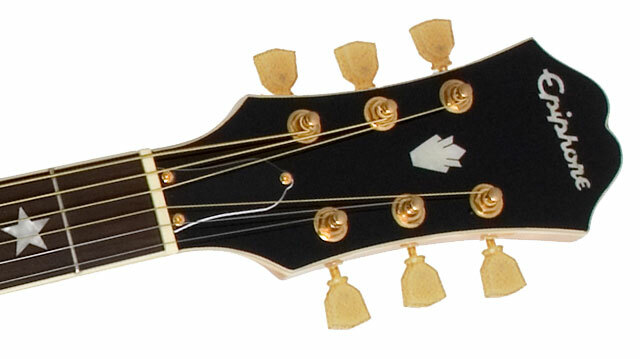 The EJ-200E also includes gold premium tuners and strap buttons and gold screws on the traditional “bell” truss rod cover.